To promote proper stewardship of all natural resources in Lake County. We are here to assist all residents in Lake County with their Conservation needs. We can help you design, measure, and layout shelterbelts and windbreaks. We recommend species, spacings, and placement for your tree plantings. We offer full machine tree plantings along with laying fabric mulch over your machine planted trees. You can also purchase trees for your own handplanting needs, and we also have tree protectors available to be ordered, to prevent animals from browsing your new tree seedlings. Click here to download the 2019 Tree Order Form. Lake Co Conservation District orders and plants trees every spring. We can usually inventory most of the trees on the order form. Our initial order is placed around Thanksgiving of each year, and we will supplement that order as we are able with available stock at the nurseries. If you don’t see a tree species that you are interested in, please contact us by phone or email and inquire with us. We will be happy to check to see if there is some possible availability from our nurseries. We typically order and inventory tree stock that is suitable for growing in our area of South Dakota. Most stock is bare root and dormant and approx. 18-20 inches in height. Please look through our order form and contact us with questions. We are here to assist you!! We provide complete Machine Planting Services, and the quoted rates include custom planting, equipment and labor, and the trees. Trees planted at less than 7' in-row spacing - $7.75 per rod. Trees planted at more than 7' apart in-row spacing - $6.75 per rod. Fabric Mulch Services - complete service - 6 foot fabric mulch for newly planted tree plantings is $.75 per linear ft. Contact us with your questions and needs on other conservation needs, such as seedlings, construction of waterways and terraces, rotation grazing plans, etc! Lake County Conservation District hosted their 2nd annual Soil Health Day at Nicky’s in Madison on Wednesday, Sept 26th. Two Lake County producers, Bill Nelson and Aaron Johnson, gave talks on implementing “soil health” practices on their farming operations in Lake County. Both Nelson and Johnson are Soil Health Champions, under the “NACD Soil Health Champion” program, which is a program created for the purpose of sharing information and conservation methods with other producers about management practices that will improve soil condition and productivity. Lynsee Planting, NRCS District Conservationist, spoke as well on implementing “soil health practices”. Also included in the program were Barry Berg, project coordinator from the Big Sioux River Watershed Project, speaking about Riparian project work that had been accomplished under the Big Sioux River Watershed Project. And Angela Ehlers, Executive Director for the South Dakota Association of Conservation Districts spoke regarding the different items that are coming before the South Dakota State Legislature in 2019 that are sponsored by or impact South Dakota’s Conservation Districts. 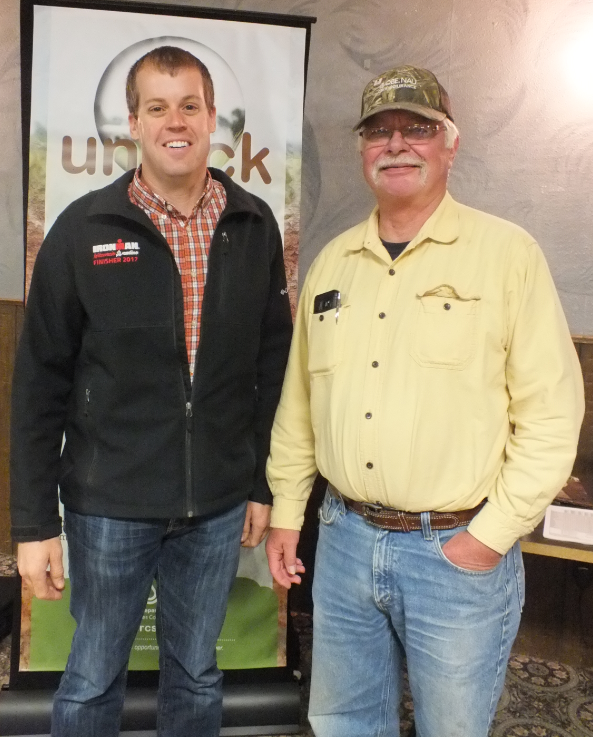 Aaron Johnson (left) and Bill Nelson, farmers in Lake County, spoke about implementing soil health practices on their farms at the recent 2nd annual Soil Health Day hosted by Lake County Conservation District. The Lake County Conservation District is sponsoring the 2019 Speech Contest for all high school students, grades 9-12, in Lake County. The topic for this year's speech contest is "Ag Technology: Farming and Ranching for a Future". Two winners from the local Lake County contest will be eligible to advance to the area contest and two winners from the area contest will move to the state finals. Monetary awards are given to the winners at each level. The State Contest awards scholarships to the three top speeches. To receive an entry form and the contest rules, please contact Michelle at the Lake County Conservation District, 256-2571, or email lakecd@sdconservation.net. The local contest must be completed on or before March 30, 2019.